80% less frame cutting when compared to typical 4 7/8� electric strike installations. For new or replacement installations in aluminum frames. 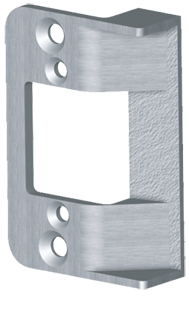 Use with 4510, 4710 & 4750 Adams Rite® dead latches. Replaces 4502 strike plate with slight modification.